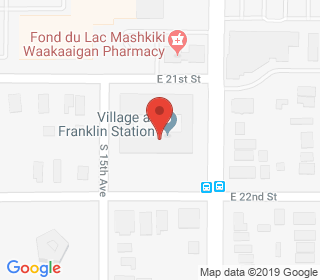 Village at Franklin Station is a senior community located on the corner of Franklin Avenue and Bloomington Avenue in South Minneapolis. Franklin Avenue boasts of the award wining “Franklin Bakery” and the “Wolf’s Café”. Franklin Avenue has a major grocery store and drug store along with many specialty stores and all within walking distance of the property. South of the property is Lake Street with international shopping and restaurants. North of the property is downtown Minneapolis with all there is to offer. East of the property and only moments away is downtown St. Paul. You can’t get a better location for senior urban living than Villages at Franklin Station.